Sis. 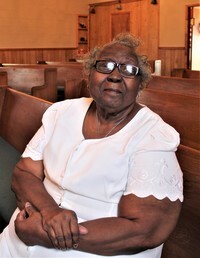 Norma Watkins, a native of New York CIty, moved to NC in 1984 and married the late Earl C. Watkins. Ms. Norma joined Orange Cross Roads a year after she moved here and became an active member of the Sunday School and Missionary Dept. She also served as youth and young adult advisor. Through her efforts, the young adult department held it's first retreat in the NC mountains.They also collected needed items for the battered women's and the homeless shelter as well as a family adoption at Christmas. Sis. Watkins was always faithful and had perfect attendance at Sunday School. Despite her declined health and ability to be at Sunday School or regular service on a regular basis, she forges ahead when possible. She always makes sure that she makes it to the various annual services each year. She continues to support and be in constant prayer for her church and church family. Sister Norma Watkin's motto is: "When you let God lead, it is an easy path with only a few bumps to keep you going straight."